Were the Portuguese ahead of the game where diesel is concerned? We pass by this second-hand car lot most days of the week. The car in the middle, which seems to have been there for ever, never fails to raise a smile. Somehow we are always pleased that the "Diesel Slug" has never been sold. 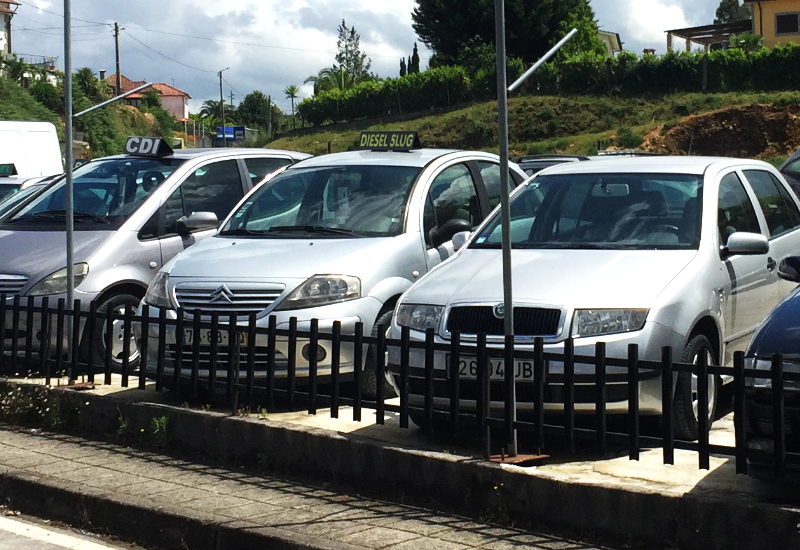 "Ah," we think, "The clever Portuguese have never been fooled by diesel. They have always known it's a bad thing. Thus the name they've given this car!" To find out what the sign really means, click here. Of course, it doesn't really say Diesel Slug at all. The confusion is all in the spacing. What it actually says is 'Diesel 5 Lug', which is short for 'lugares' which means five places, or in this case five seats. All the same, I shall be sorry if one day we pass by and the slug is no longer there. Along with funny English in menus, for me it adds greatly to the gaiety of nations.